The Big Takeaway: Curt Hawkins went 0-265 in losing to Rezar, who remains undefeated as a singles wrestler on the main roster. In the main event, Raw Tag Team Champions The Revival lost in an eight-man tag match that saw Viktor take the fall from Titus O’Neil. Rezar is now 5-0 as a singles competitor on the main roster, while Hawkins' perennial losing streak has now hit the dizzy heights of 0-265. But Hawkins has his tag team with Ryder and seems to be fairly content with his lot right now. People forget that Hawkins is actually pretty perfect in this spot. He works really hard to make others look good and, up against big men like Rezar, will fly all over for them. Unfortunately, when power moves should be his go-to, Rezar resorts to rest holds, but they had a perfectly fine match here that got better the more Hawkins got the hope. Hawkins tried everything he could to get Rezar off his feet and eventually did so with a second rope shoulder barge. He then nailed Rezar with two DDTs and a top rope elbow drop, but could only get a two count. The crowd really thought Hawkins had him. Rezar then popped up, unfazed, and caught Hawkins in his tracks in a choke hold and threw him up for a chokeslam in the middle of the ring for the win. As has been proven of late, WWE has no issue in beating their champions. And although they didn’t take the pinfall, I guess we shouldn’t be surprised to see The Revival lose. However, there will likely be a few eyebrows raised that the Raw Tag Team Champions were back on this show to begin with. 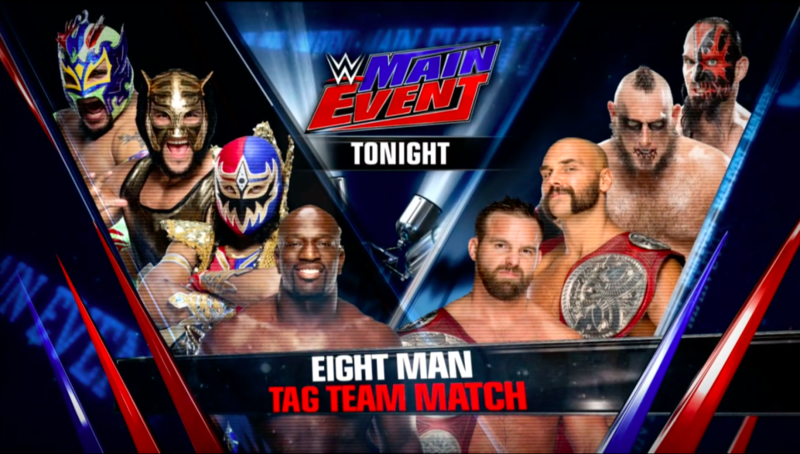 The Lucha House Party and Titus O’Neil made for fairly strange bedfellows, but O'Neil was the man to give their team the victory here in a match that ran at just over three minutes and yet still went through a commercial break. There was literally no point in having all eight of these men out there. After the initial lock-up between Kalisto and Scott Dawson, we went to a break. When we came back, it was Kalisto and Konnor. Konnor tried to cut the ring in half and sold as woodenly as The Warlord circa 1991. Kalisto squirmed out and gave the hot tag to O'Neil. Everyone sort of disappeared and O’Neil clumsily ran wild, then gave the Clash of the Titus to Viktor to pick up the win. This felt like your typical WrestleMania season fodder: stick everyone out there so that they at least get on the card and so that they can get some airtime, but the entrances lasted longer than the match and no one really got over.